The ability to view the pelvic and abdominal contents depends largely on the quality and condition of the laparoscope. An alteration in the lens system that is used to construct these laparoscopes (specifically the Hopkins rod lens system) has resulted in a marked improvement in image clarity. Image quality is also affected by the diameter (size) of the lens contained within the laparoscope and the ability of the laparoscope to deliver light to the tissue being viewed via fiberoptic bundles. The diameter of the lens system in (and the amount of light delivered by) a 10mm diagnostic laparoscope is greater than that found in a 5mm diagnostic laparoscope. Thus, a 10mm diagnostic laparoscope can transmit more information than a 5mm laparoscope. The 11mm operative laparoscope contains a relatively large CO2 laser channel so the size of the lens system and the amount of light delivered to the tissue being viewed is less than that of a 10mm diagnostic laparoscope. A 5mm laparoscope is able to provide a very good image and it is often useful when placed through a 5mm lower abdominal trocar site to view the upper abdominal regions (that can be difficult to see using a 10mm laparoscope through the upper abdominal trocar). 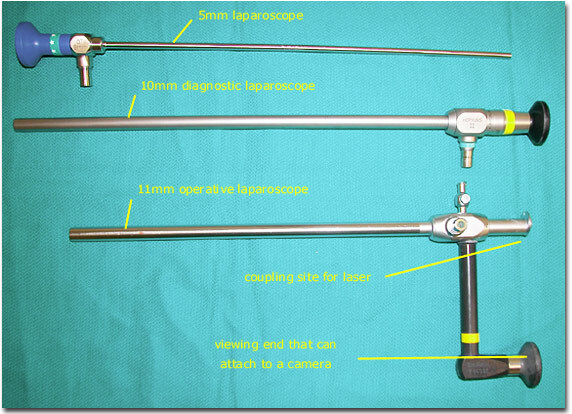 The 5mm laparoscope is perfectly straight, but appears curved in this picture due to a photographic artifact.